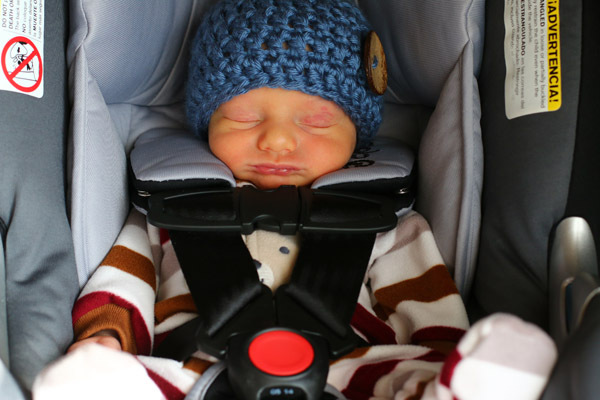 I can’t believe we have been home with Ezra for just over two weeks already. We are all so completely smitten over him. Between my recovery and the big pre-sale last week on The Fringe Hours, I had much energy to blog, but I am getting back in the saddle this week. I have missed blogging daily and the community here! This recovery has been very different for me because I have never had a c-section before. Heck, I’ve never had surgery! My c-section was a bit more complicated because in addition to having Ezra, I had a tubal and an unexpected cyst removal on my uterus. Needless to say, my abdomen was very, very sore for the first 10-12 days. I am still sore, especially if I do too much during the day, but each day is getting better. I also developed a skin infection in the hospital, then 7 days later, an allergic reaction to the antibiotic – so that was fun. 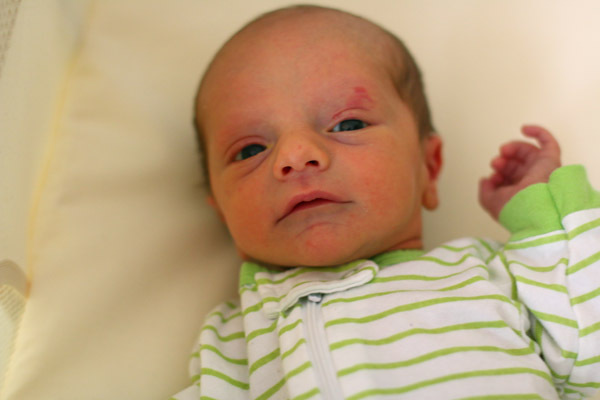 Ezra is the sweetest, most relaxed, easy-going baby. He rarely fusses, unless I am taking too long changing his diaper when he is ready for milk. He is a champion nurser. He tends to get up every 2-3 hours during the night to eat, so I am not getting a lot of sleep. He also doesn’t seemed phased by noise at all, and pretty much can sleep through any sort of commotion, which is a blessing! He is the tiniest of our babies, and I still marvel at his size every day. 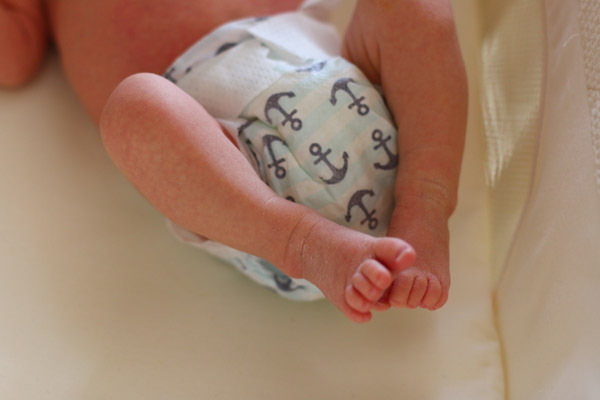 He can only wear newborn clothing, and even some newborn outfits swim on him. That said, he is getting a little bigger every day! While he is still sleeping A LOT, he is having more periods of wakefulness and it is neat to watch him taking everything in. When he sleeps, he often makes little grunts and noises. He is just so, so sweet. For us, going from two to three kids hasn’t been a huge challenge. Elias and Adeline are always willing to help with anything related to the baby – getting blankets, bottles, clean clothes, etc. As Ezra has been becoming more alert, they love to lay on the floor and talk to him. They both talk to him in high voices and it cracks me up. Adeline has nicknamed him Ezry. They also both love to hold him, especially Elias. It is the first thing they ask to do when they get home from school. Today we set up a little play mat for Ezra to be on and the kids were so excited about hanging toys on it and getting it ready for him. 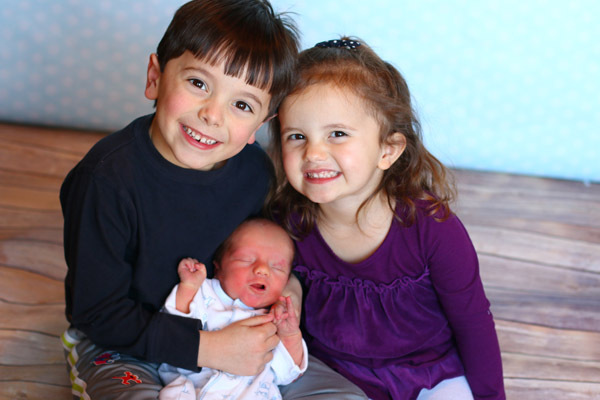 It has been such a joy watching Elias and Adeline embrace Ezra being older siblings. I have really been doing my best to savor every day with Ezra. These past weeks have felt incredibly sacred. Looking back, with Elias, he was our first, so I didn’t comprehend how fast it would go. Plus, because he was our first, we had a lot of company. 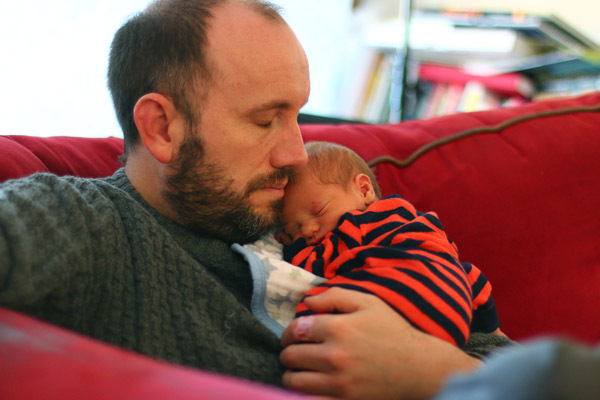 That combined with a very short maternity leave (only six weeks) meant the newborn phase was a bit of a blur. 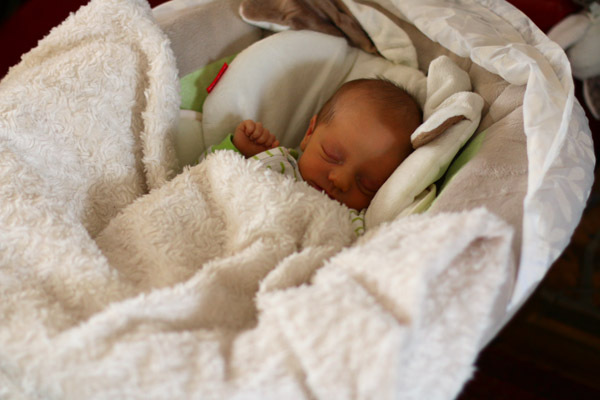 With Adeline, my recovery was really, really brutal and she was pretty fussy, making those first weeks extra hard. By the time we got our rhythm, she wasn’t a newborn anymore. But everything seems different this time. I am more comfortable in this newborn phase and in my mama skin. My recovery hasn’t been as challenging and Ezra is a breeze. And knowing that he is our last has made every moment extra special. I have also been taking lots of photos and have already started working on Ezra’s first year Project Life album. After six months of neglecting our family Project Life album, it feels good to be documenting again. Previous article: Last Chance: Fringe on Amazon for $7.49! so glad you are starting to feel better! 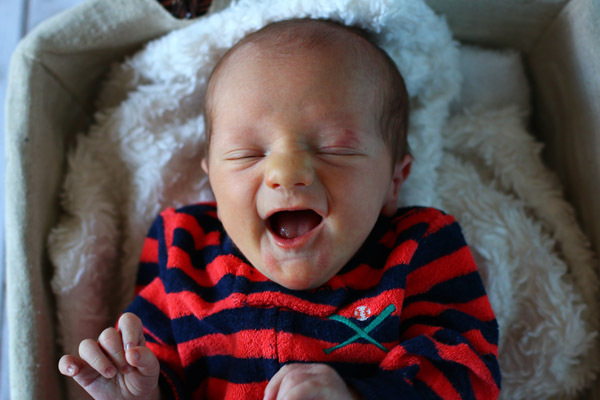 Ezra is adorable…thank God for easy 3rd babies! Grace was like that too 🙂 happy to have you back to the blog!! aw, glad things are going well! That last pic looks just like Elias! The third is one to savor, I felt the same way. Beautiful! I’m so glad you are getting this sacred time to enjoy him. I thought of you because the Disney Store online has free shipping today and Stsr Wars Rebels Ezra shirts are only $3.99! I’m so glad you are feeling better! I felt the same way after my c-section. It’s amazing the improvement that happens daily. Continue to enjoy those precious newborn snuggles…and the naps that go with him, as you catch-up from the nighttime wakings! He is beautiful! So glad to hear you’re recovering, and the kids are adjusting to being big siblings (again). I’m quite impressed with you undertaking a book launch and the newborn phase simultaneously!